When eating at an ethnic restaurant anywhere in town, I often ponder the authenticity of the food being served. Vancouver diners often get shortchanged in this department – certain cuisines (think sushi) being served by untrained “chefs”, unsuccessful re-interpretations of regionalized cooking (think “Szechuan”), classics of a cuisine automatically “dumbed down” with prejudice for fear of offending unadventurous tastes…I could go on. In order judge the “authenticity” of a restaurant, I often have to rely on my experience in that particular cuisine gained from my travels, or from my attempts at cooking it, or sometimes through some sort of intuitive gustatory extrapolation. Still – on cuisines where I have little experience, I wonder whether a dish I am currently enjoying is an exemplary example….and I reassure myself that if I’m liking what I’m eating, that’s all that really matters. The food of Southeast Asia is something I know quite a lot about – experience I gained when lived in that part of the world….so I know almost instantly whether a dish is hitting its target in terms of authenticity. Seri Malaysia is a non-descript Halal Malaysian restaurant on Vancouver’s East Hastings St. The restaurant, like its Hastings St environs, is a little run down. It could use a paint job, the awning needs a wash, and the decor needs some re-thinking. The ambiance, however, is not why I keep returning here – I come for the food. Much of Malaysian food is bold in flavour – often pungent and unsubtle. It uses a lot of curry spices, strongly flavoured and scented botanicals (lemongrass, galangal, and so forth) and fermented seafood (for example: belacan – a dried fermented shrimp paste, and ikan bilis – dried anchovies). Seri Malaysia serves what I believe to be the most authentic examples of some of the classic Malay dishes here in town (with a disclaimer that like most countries in the Straits – the cuisine is highly regional and does vary significantly). As if to validate my assessment of the food here – on my most recent visit here a couple of days ago, none other than the Consul General of Malaysia came in to dine with some compatriots a couple of tables away. I had a quick chat with these gentlemen on my way out. I understand that the Consulate regularly orders the Rendang and other items here from here in bulk whenever they have official banquets. The Beef Rendang (a dish of Indonesian origins) is delicious – tender beef with strong hints of lemongrass (you can see the lemon grass fibers in the sauce). I’m not sure what cut of beef was used to prepare this one – probably chuck or something similar. A more celebratory rendition would use the meat from short ribs or shank. Rendang takes hours to cook properly…and it gets better with age. I also ordered the Chicken Curry which is traditionally prepared in coconut milk. It was well seasoned and tender, though perhaps a little toned down in chili heat today. You can always order one of the three or four kinds Chili Sambal to adjust the heat. The curry wasn’t an exemplary dish, but it was still very good. The Roti Canai (the Malaysian rendition of an Indian flatbread) was nice and flakey (almost croissant-like) and not at all oily ( a common misstep in its preparation). The Roti was perhaps not the best one I have had in town, nonetheless, it was a perfect vehicle for the curry sauce. Chefs who serve me food “the way it should taste”…whatever that means to them…have my admiration. It is an indication to me that they have respect for their diners – they make no assumptions and they will ask you questions about your preferences. Vancouver is a town full of adventurous diners…yet I fear for this place and other restaurants like it. Chef Jamal has indicated to me that it is a struggle for him at this location (he often runs the entire show by himself- he is the waiter, cook, dishwasher, and host – it really shows when the place is busy). He has, in fact, considered throwing in the towel on occasion (I sure hope he doesn’t any time soon) and he is on the lookout for a better location. If you are on East Hastings Sunrise area and you are a little peckish, check this place out. They have inexpensive lunch specials (under $7), but I think it is worth it to order from the full menu. It has been a horrific winter here in Vancouver so far. The incessant snow and now the subsequent downpour has really been cramping my eating. We have had rare respite from the weather which forced us to postpone and cancel a few holiday family gatherings. Here at home, I have been feeling cabin feverish and I had been dying to get out. Luckily, I live near Commercial Drive – a good neighborhood with affordable eating within walking distance. My last few dining forays outside involved Asian food – mainly noodle houses on Hastings St and Vietnamese pho joints nearby. Yesterday, I felt like something different….”Tunisian”, I thought to myself. The Carthage Cafe specializes in French-Tunisian cuisine. It is the kind of place that helps provide Commercial Drive with the reputation of being a street where you can find diverse and affordable dining experiences. This street is lined with restaurants of various ethnicities — Italian, Cantonese, Sichuan, Ethiopian, Jamaican, Salvadorean, Vegetarian (is that a bonafide ethnic group? Methinks yes. ), Mexican, Cuban (if you count the Havana as “Cuban”), Belgian, Japanese, Indian, Portugese, and of course, Tunisian, just to count a few. I had been to the Carthage a couple of times before. I had their very good Mussels in Broth both other times I was there. Today, I thought I would try one of their truly authentic Tunisian dishes – their Chicken Tagine. The restaurant itself is very well appointed. I walk past it nearly everyday and I have always been impressed with the efforts that the proprietors have taken to make it look and feel upscale. The decor on the outside and inside truly makes it feel like a bistro or a brasserie in Paris – with the dark wood tables, darkly finished trim, tiles, and in this case, the nice Middle Eastern touches (the very cool looking ceiling lamps, for example). The tables are always set with clean, gleaming wine glasses, linen and tableware – even when they are closed. The menu is focused – with only a couple of the classic dishes of this cuisine represented – couscous dishes, for example. For the most part, the menu falls squarely in the “French-Tunisian” fusion. The service was prompt and efficient – unusual for Commercial Drive where we normally get lackadaisical waitstaff and ineffectual management. My server refilled my water and bread basket without my prompting, and my food came within minutes of ordering. The tagine came piping hot…and it smelled terrific – with the notes of Middle Eastern spices (cumin, coriander, etc.) filling the air. I don’t have much experience in authentic Tunisian food (since it is a rare beast in this part of the world and I haven’t been to Tunisia or had it in France where this cuisine is well represented), so I will just have to rely on objective experience. I have attempted to cook it myself in the past – I relied on recipes from some of my cookbooks…so the tagine I have made previously will have to be my own benchmark. With the looming recession starting to negatively affect restaurants around town, I fear for some of these smaller, more obscure (and definitely highly affordable) ethnic spots. While Vancouver has a reputation of being a great food city, the majority of diners tend to gravitate towards mediocrity…chains such as Milestones, Earls, and the like will probably do fine over the next few economically bleak years. I think it is the duty of those who seek deliciousness and diversity to patronize restaurants such as the Carthage. Don’t save up your dining dollars for “Middle-Eastern Inspired” dishes at chain restaurants…go to the real deal. 3765 South Las Vegas Blvd. Along The Strip, you can still find a proper non-hotel affiliated, family-run, ethnic restaurant… if you look carefully. One of them can be found in a building recessed behind a small mall housing some shops selling tacky Vegas trinkets, beside the MGM Grand and across the street from the Monte Carlo. Ginseng II Korean BBQ Restaurant is not visible from the street, and if it were not for the large digital signage that flashed Korean Hangul that I saw while driving by on the first day of my recent stay, I would not have know there was a restaurant back there. I noted it in my memory and revisited the area on foot the following day. Once inside, I asked the waitress why the “II” was noted in their name; she remarked that they have their first establishment in Los Angeles, and this is their second venture. Being the entertainment city that it is, I immediately noticed that some of the handwritten autographs tacked to a wall near the front cashier were for some of the biggest names in Korean entertainment, such as one from the actor Jang Dong-Kun. A far cry from the B-list actors and singers you see on the same autograph boards in Vancouver’s Korean restaurants. Seated in a comfortable booth that could easily seat six people, we ordered from the menu a pair of dishes. Yes, I decided to continue my hunt for my most favorite edition of Soondubu outside of South Korea. 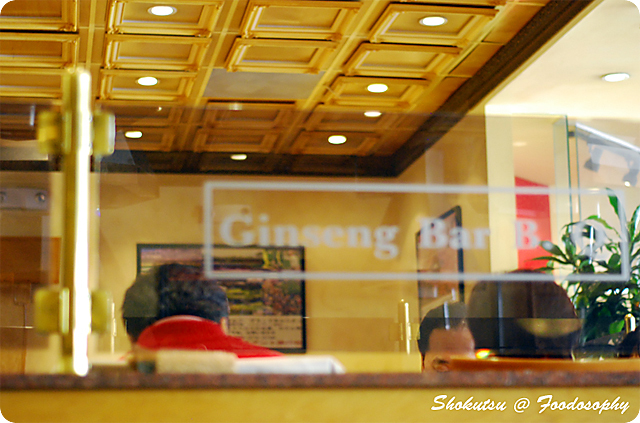 At Ginseng, their creation was surprisingly good. I’d say I would rate it up there with my current favorite (from Insadong in Coquitlam, BC), with its depth of seafood flavor in the rich spicy broth, and plenty of delicious soft tofu adding that delicate texture to the mix. The only factor that would take them down a notch in the rankings would be the volume of various seafood bits inside, Insadong has a slight edge here. 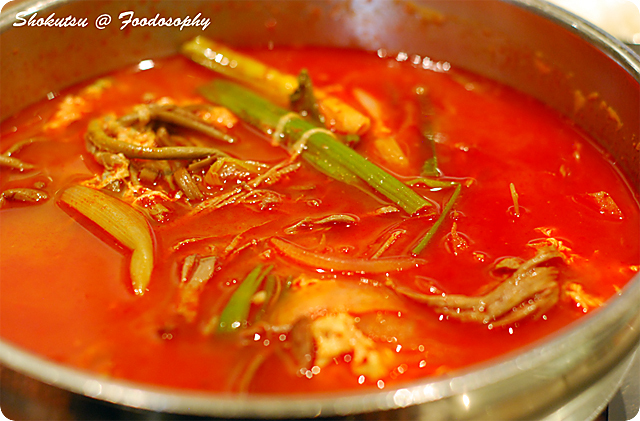 The Yukejang (spicy beef soup) comprised of a watery and slightly sour but mainly spicy broth that included shredded beef, tang myun (clear noodles) and an assortment of vegetables such as gosari namul (bracken fiddleheads), and green onions was as expected. 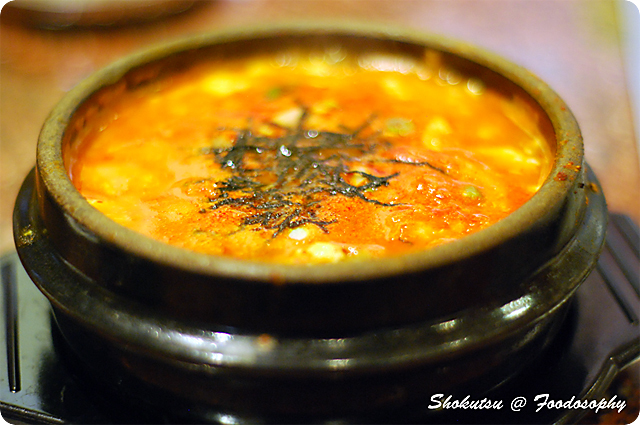 A relatively straightforward dish, that is less fiery in comparison to the Soondubu, begins to taste overly “beefy” if eaten to the very last drop. For me, this begins to be a turnoff towards the end of the meal, as the meatiness of the dish just lingers on my taste buds. No complaints though on how it was prepared, as there was nothing out of the ordinary from versions of this that I’ve tasted in Seoul. It doesn’t always pay to be on the leading edge. In Jennifer Lee’s book, “The Fortune Cookie Chronicles”, she documents how migrant Chinese workers moved into the restaurant business in the early 1900’s. Rather than serve traditional Chinese food, which would be a tough sell, they served the invented dish Chop Suey; as both a big joke on all the “white people”, and to sell palatable Chinese food to a culture that was adverse to most of the qualities of authentic Chinese food. With increased global awareness, this challenge is not uncommon today either. 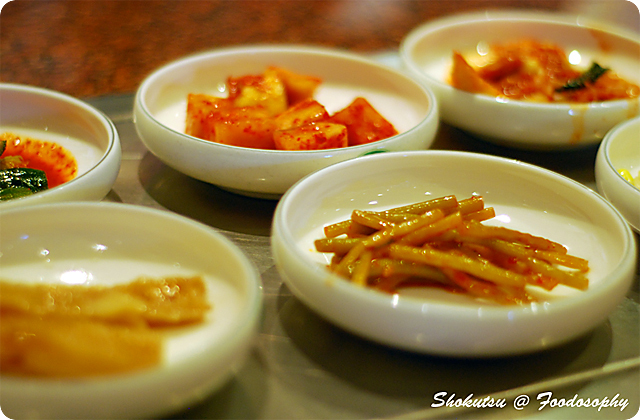 New cuisines, as they enter a city, or another culture, face many different challenges. They are responsible for educating a whole new audience on the flavours and values that make up their cuisine, while serving something that will suit their tastes. The end result is often a watered down, blander, less authentic version of the cuisine. Sort of like Chop Suey. Puspa East Indian Restaurant is located in a small stripmall in NW Calgary. While they were not one of the first East Indian restaurants in Calgary, they were definitely on the leading edge, having been around for more than 15 years. The restaurant itself is littered with old reviews ranging from 1994 to 2001, which always makes me nervous. The decor itself is dated, but the environment is very clean. A smiling proprietor appears from the back a minute after I enter the establishment – apparently the only one serving today. I am promptly seated. And the proprietor disappears again. During their lunch hour, instead of a buffet, they have lunch specials available. Basically a plate of curry available in a variety of meats, on a bed of rice and salad. Ringing in under 10 bucks, the price is definitely a good selling feature. I order the lamb curry, and a side of naan as well. The curry arrived as stewed meat with no distinguishable curry flavour. The salad was limp. The rice was ok. The meat was recognizable as lamb. A bit tough and stringy, but I knew what i was eating. Surpsingly enough, their menu actually has some interesting dishes on it. Unfortunately, in what i sampled, their food lacked the heat, spice and depth that make up the Indian food that i enjoy. Their longevity obviously speaks to some level of success, but for those of you who have developed a more distinguished palate when it comes to Indian food, this may be a place to pass on. With reviews from 2001 and prices to match, It’s too bad really that they havent managed to adapt their flavours for a more modern audience. Because really, a good Chop Suey can still be good.